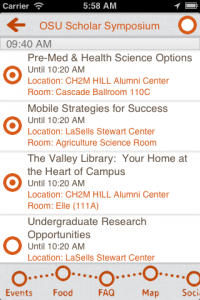 OSU Mobile has once again published generalized finals schedules on the mobile site, m.oregonstate.edu. Current support is limited to iPhones/iPod touch, Android, PalmPre. Some Blackberries with newer browsers will also contain most of the functionality. Classes are listed by subjects, and then selecting that will show the class designations and sections of the class. If a class has multiple sections, find your appropriate section. From there, a person can see the class, date, time and room. There are some classes that are group finals, and for room information, students would contact their instructor for this. We’ve also provided the phone number for the Office of the Registrar, if there are questions around class times or rooms. If a class has a building designated, there will be a small map. If you click the small map, it takes a person to a larger map that can be zoomed in on most smart phones. Thanks to the Office of the Registrar for their collaboration. If you notice any discrepancies, please let us know. Now on OSU Mobile, in v0.2 of our Alpha release, we have People live search. 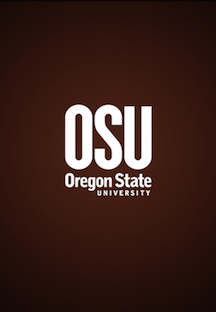 Simply navigate to m.oregonstate.edu on your mobile phone, select people, and start typing in a name, email or phone number, and for select phones, results will begin to appear with the live search feature in v0.2. You probably noticed just then that we said select phones, right? Well, it’s true, the live search feature is only for phones capable of handling the dynamic querying. For now, this means all the iPhone, Android, and Palm-pre users. What about all of the people on Blackberry you ask? Well, some functionality exists right now, but we’ll be working on Blackberry phone support in the near future. For some Blackberry phones on newer versions, the live search may be functional, other Blackberry OS versions will just be able to get a normal search, where you type in the name and hit the enter key to get a result. Because Blackberry phones handle aspects differently, there may be slight differences in feature capabilities. For all other non-smart phones, we will also be looking at what the right strategy is to deliver information to these type of phones. But don’t hesitate to let us know that you want to have some capabilities for your phone as well. Leave us a comment here and tell us what you would like to see. One of the other things added is a Library menu item to help make it easier to navigate to the Library’s mobile site. So that’s it for v0.2 right now, for all you people on the go. How to use the Live Search: Start typing a name, first or last, email address, or phone number, and a set of results will be returned to you as you start typing. The more you type, the narrower your list becomes. For this release we only list the first 20 results, so the narrower your search, the better. While we hope to have flushed out as many bugs as possible, it is always possible there may be one or two you will encounter. If you notice any, please send us a note via our help ticket form. This feature release brought to you by the people of Central Web Services in collaboration with Enterprise Computing, the Valley Library, Web Communications and others. The first thing to remember in Navigating OSU Mobile is not while driving a vehicle. There’s a law in Oregon that only permits hands-free talking while driving, for those age 18 and over. If you are navigating OSU Mobile, you are definitely not hands-free. Read up on the law if you are not aware of it. So, you’re not driving? Well then don’t forget to look up and know where you are if you are walking and navigating, so you don’t run into a pole or a trash can or in front of a vehicle or into another person. Aside from that, Navigating OSU Mobile is relatively simple in the current version. The front page has the OSU logo, and underneath the icons and text for various menu items. Each menu item takes you to a page in OSU Mobile that you can then further navigate, or that will provide information, links and the footer to select the full OSU website. The second level page, for example, when you click on Buildings, changes the top header, to include an arrow tail Mobile OSU logo, that when clicked will return you to the main page. After that the title of the second level page is shown, and underneath the same style of navigation as the main page or other information. Going to subsequent depths of navigation, will display the arrow tail Mobile OSU logo, the previous navigation page, which when clicked will take you back to the page listed, and the title of the current page, in addition to further navigation or information underneath the header nav bar. Stylistically, a different approach was taken with the Alpha version of OSU Mobile to indicate how to navigate with the arrows being within the design instead of the traditional button style. 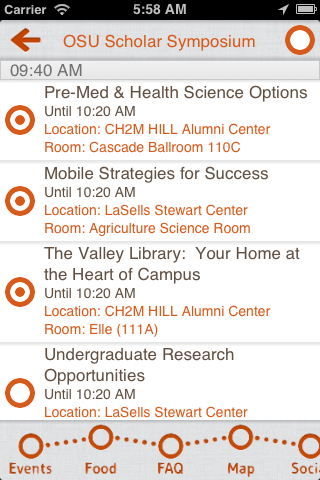 In the image shown here from the Finals Schedules, OSU takes you back to the OSU Mobile Home, and Subjects takes you to a list of available courses. Art is the title of the current page and is not clickable, and underneath is either information or additional navigation paths. And that’s basically it for navigating mobile. Simple? We hope so. Have you heard or seen? 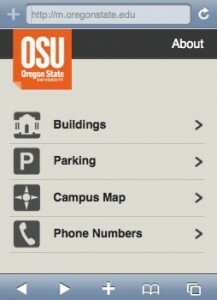 OSU has launched the new mobile site, m.oregonstate.edu. The official launch date was on December 7th, 2009, and there was some information in The Daily Barometer and on OSU Today about this, if you want to read what was said then. Or you can find more information here as we continue with its development. This project was a collaborative between Central Web Services providing the core mobile development efforts, Facilities, the Office of the Registrar, and Web Communications. What you missed if you did not see it during the launch week was the display of finals schedules, thanks to the information provided by the Office of the Registrar. Not to worry though, there’s plenty more finals to come along in 2010. So why mobile, and why now, or really why back in December? The reason is simply the prevalence of mobile computing in the world today. Phones that weren’t smart are becoming smarter, and the smart phones, well they are just adding more and more. There are plenty of studies on how mobile computing is where people will find their main source of information in the future, so I’m not going to rehash that here. Just use your favorite search engine and go read about it. So why now? Now because we cannot afford to wait and be left behind other Universities that are advancing on this front. The reality is, trying to find a building isn’t something you should have to pull your laptop out of your backpack, especially when it is raining, or go find a computer lab and a computer to log on, to find a building. Much of this information can be provided via a mobile device, and for certain phones we have in fact provided this. What we dubbed the alpha release, which is a working release with a few main features, buildings, parking, the full campus map, and some essential phone numbers are provided via m. There’s still some things to work out to provide in future releases, such as providing location information, and other detailed information, but the alpha release was just that, alpha. Showing this now, provides the OSU community the ability to see some of the capabilities that mobile can provide, and let’s us ask the question, what’s next? Well, how about a directory search? Or News or personalized class schedules or finals? These things are all possible. No doubt everyone has seen news releases about all the numerous schools with iPhone applications, right? Stanford, Duke, the University of Texas and others have released or are releasing applications specifically for the iPhone. 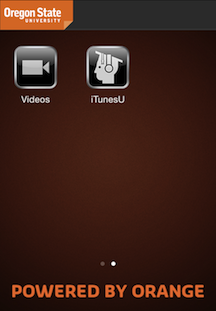 Did you know there is a team working on an OSU iPhone application as well? That’s right, there is a Capstone Project that is working on just this. So then you ask, why another mobile platform? The simple answer is that not everyone is walking around with an iPhone. If you’ve acquired a Palm Pre, or an Android, or a Blackberry, what do you do? Well, that’s why we have m.oregonstate.edu. Currently, Palm Pre and Android phones will be supported (ie. you should be able to see and use the site). The newer Blackberries also will work for most features. With some of the older blackberry models, the UI will not be correct. We’ll be laying out a list of supported models soon, and we’ll provide a blog post on it soon. Unfortunately we won’t be able to support every single phone, but we figure the ones we do will be a good subset. 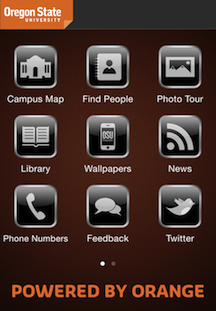 And did I mention m.oregonstate.edu will also work on the iPhone? There is plenty left to do, but the way I see it, we’ve only just begun.